Gaius Plinius Secundus, or Pliny the Elder, was born in the year 23A.D. He was the son of an equestrian born in Como. He came from the Plinii family, but made his own family name, Secundus. Pliny entered the army in 46 A.D. at the age of 23. 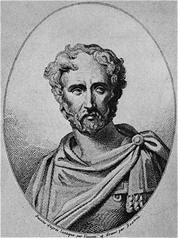 Pliny, during his army work, helped to defeat the Germanic Chauci tribe, and helped construct the canal between the Maas and the Rhine. While in the army, Pliny began studying missile use on horseback. By 56 A.D., Pliny's service was up, but did not leave the army. Pliny lived in Rome soon after the Great Fire, and remembers the building of Nero's great palace. Pliny did not personally know Nero, but in his later career as a soldier, Pliny took orders from emperor Vespasian and rode in the army with future emperor Titus. Pliny continued to study nature, observing a solar eclipse in Campania in 59 A.D. As a senior officer in the army in 69 A.D., Pliny was sent to Africa, where he spent time studying poisonous frogs. While working in Hispania from 70-72 A.D., Pliny learned agricultural techniques and studied gold mining methods. Pliny used this information for his books, which he began to write in 69 A.D., the year that Nero's oppressive reign ended. Pliny was wrote about many different topics, creating works that are closer to encyclopedias than to anything else. Though Pliny wrote on history and conspiracy, his most famous works are those on natural history. Pliny's last book is called Naturalis Historia, which is an encyclopedia of the knowledge Pliny gained over his life. The book covers the subjects of botany, zoology, astronomy, geology, mineralogy, and technology. Much of what Pliny wrote about has been confirmed through archaeological finds, and the book remains one of the most important surviving written works of the Roman Empire. Much of what we know about Pliny the Elder was recorded by his nephew, Pliny the Younger. Among these facts is an account of Pliny the Elder's death. Pliny, in August of 79 A.D., was stationed in Misenum, across the Bay of Naples from Mount Vesuvius, which loomed over Pompeii and Herculaneum. When Vesuvius erupted, Pliny was preparing to observe the volcano more closely when he received word from a friend asking for rescue from Herculaneum. As Pliny's galley's reached Herculaneum, pumice and cinders began to fall. On the beach of Herculaneum, Pliny's men helped to save quite a few people, though in the process, Pliny became weak and couldn't walk without help. Eventually, Pliny died. Most believe that Pliny died due to the combination of toxic volcanic gases and the asthma that Pliny suffered from. Pliny is on our list because not only was he alive for the reign of several of the most famous empires and witnessed the eruption of Pompeii, but because Pliny the Elder was a brilliant naturalist, scientist, and writer, gaining fame not only in his time period, but in our time period as well.